The circadian clock proteins KaiA, KaiB, and KaiC reconstitute a remarkable circa-24 h oscillation of KaiC phosphorylation that persists for many days in vitro. Here we use high-speed atomic force microscopy (HS-AFM) to visualize in real time and quantify the dynamic interactions of KaiA with KaiC. KaiA transiently interacts with KaiC, thereby stimulating KaiC autokinase activity. As KaiC becomes progressively more phosphorylated, KaiA’s affinity for KaiC weakens, revealing a feedback of KaiC phosphostatus onto the KaiA-binding events. These high-frequency binding and unbinding events refine the period of the longer term oscillations. Moreover, this differential affinity phenomenon explains how the oscillation is resilient in a noisy in vivo milieu. Circadian rhythms are circa-24 h oscillations in biological processes that are controlled by an endogenous biochemical pacemaker. The processes coordinated by these clocks range from gene expression, metabolism, and cell division to development and behavior. A key diagnostic property of these biological clocks is the robust persistence of the oscillations even under the fluctuations of molecular components that can affect intracellular oscillators. In fact, the deviation of the oscillation period is only a few min per day. The cyanobacterial system possesses the clock proteins, KaiA, KaiB, and KaiC. These three proteins reconstitute a circa-24 h rhythm of KaiC phosphorylation that robustly oscillates in vitro. Here, we explored the mechanism underlying the robust circadian oscillation of KaiC phosphorylation resilient to concentration changes of these protein components, using HS-AFM and in silico simulations. where “p” indicates phosphorylation (Fig. 1c). To study the dependence of KaiA binding on the KaiC phosphostatus, we observed with HS-AFM four phospho-mimic mutants, KaiC-AA (mimicking the S/T state), KaiC-AE (mimicking the S/pT state), KaiC-DE (mimicking the pS/pT state), and KaiC-DA (mimicking the pS/T). For HS-AFM observations, these mutated KaiC hexamers were attached onto the PS-mica so that their CII rings faced towards the solution, and KaiA (1 μM) was added to the bulk solution. The HS-AFM imaging indicated that the affinity of KaiA for KaiC decreased in the order of KaiC-AA, KaiC-AE, KaiC-DA and KaiC-DE (Fig. 1d). The residence time of KaiA on KaiC-AA was very long, prohibiting the lifetime determination. For KaiC-DE with the weakest affinity for KaiA, the KaiA’s bound lifetime was only 0.26 s. We also performed a similar observation for the wild type (WT) of KaiC, which required continuous all day and all night measurements over 51 h. As shown in Fig. 2, the lifetime of bound KaiA varied in anti-synchrony with the circadian oscillation of KaiC phosphorylation. We referred to this phenomenon as Phosphoform-Dependent Differential Affinity of KaiA for KaiC (PDDA). The PDDA effect indicates a feedback control mechanism in which the affinity of KaiA for KaiC is negatively controlled by the KaiA-binding-stimulated KaiC phosphorylation. Therefore, the PDDA effect can be considered as one of driving forces for producing a periodic oscillation of KaiC phosphorylation. It is notable that the transient, rapid (~1 s) interactions between KaiA and KaiC repeatedly occuring about 100,000-times per day regulate the long-term (~24 h) phosphorylation and dephosphorylation of KaiC. Next, we studied how the PDDA effect contributes to the resilient (stable) circadian oscillation of KaiC phosphostatus. We continuously monitored the extent of KaiC phosphorylation over 85 h, in which the concentration ratio of KaiA dimers over KaiC hexamers (R) was abruptly altered at hour 32 during the in vitro oscillation by the addition of KaiA to various final concentrations. The result indicates that the circa-24 h oscillation of KaiC phosphostatus persists when R ranges between 1.13 and 3.0 (Fig. 3a). This experimental result was confirmed by in silico simulations (Fig. 3b, 3c). When the PDDA effect was eliminated from the simulations, the period of KaiC phosphostatus started increasing at R = 2.0 and was completely abolished at R = 2.5 (Fig. 3c, black line). Thus, it was revealed that the PDDA effect discovered by HS-AFM imaging contributes to the resilient circadian rhythm of KaiC phosphorylation. Figure1. Schematics and AFM images of KaiC placed on different substrates, and KaiC phosphostatus-dependent KaiA binding to KaiC. (a) Schematic (left) and AFM image (right) of a KaiC hexamer placed on amino-silane-coated mica (AP-mica). (b) Schematic (left) and AFM image (right) of KaiC placed on bare-mica. Because of the tentacle-like structure existing on the top face of the CII ring, the central pore of the CII ring does not appear in the AFM image of KaiC placed on AP-mica. (c) Circadian cycle of KaiC phosphostatus. (d) HS-AFM images of KaiC phospho-mimics placed on AP-mica in the presence of 1 μM KaiA in the bulk solution. Imaging rate, 1 frame/s. Scale bars, 20 nm. Figure 2. 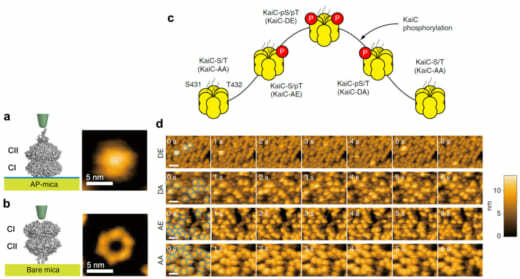 KaiA’s bound state lifetime varying in anti-synchrony with the extent of KaiC phosphorylation in the KaiABCWT system. (a) Time courses of the extent of KaiC phosphorylation and KaiA’s bound state lifetime measured over 51 h.
(b) Correlation between the extent of KaiC phosphorylation and KaiA’s bound state lifetime. Figure 3. In silico and in vitro tests of PDDA-generating enhancement of resilience. The ratio of KaiA dimer to KaiC hexamer was increased at hour 27 from 1.33 to the values indicated at the right-hand side of (b). (a) Experimental results obtained with KaiABCWT system. (b) In-silico simulation results. The results with PDDA are shown with the colored lines, while those without PDDA are shown with the black lines. (c) In-silico simulation results showing the period of phosphorylation oscillation as a function of KaiA dimer/KaiC hexamer ratio under the conditions of with and without PDDA.